In a large mixing bowl, using an electric mixer, beat room temperature butter, sugar, 1/2 c. brown sugar together until light and fluffy. Add egg and beat. Add sifted flour, baking powder, soda, 2 t. cinnamon, nutmeg, alternate with buttermilk. Fold in nuts. Pourinto a lightly sprayed 13 x 9 in baking pan. In a small bowl, mix remaining 1/2 c. brown sugar and 1 t. cinnamon and sprinkle over the top. Preheat oven to 350^. Bake 30 to 35 minutes or until toothpick comes out clean. This coffee cake can be made several hours ahead or made the night before covered and refrigerated overnight. Bring to room temperture before baking. 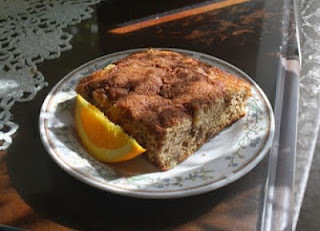 With all the wonderful apple harvests this is a great morning or evening cake to enjoy . Fresh out of the oven in the morning filling the air with warm aromas of cinnamon. Or in the evening piping hot with a scoop of ice cream. Yum! Preheat oven to 350^. Sift together flour, soda and salt. In a large mixing bowl beat eggs and sugar together. Add the oil and mix until well blended. Add dry ingrdients to the sugar and egg mixture. Fold in the apples and nuts. Pour into a 13 x 9 baking pan. Bake for 40 to 45 minutes.